Often characterised as a region of relative peace due to the absence of inter-state conflicts, the Pacific island region is not immune to violent conflict. Episodes of violence, political unrest and instability have hampered development; a ‘business as usual’ approach to development does not guarantee that the Pacific will remain peaceful in the future. The link between peace and development is a central tenet of the 2030 Agenda and the Sustainable Development Goals (SDGs) acknowledging the inter-connectedness between the drivers of poverty and conflict. This presents an opportunity to integrate and expand on traditional concepts of development and security. A holistic consideration of the social, economic, environmental and governance factors underpinning peaceful and prosperous societies sits at the heart of this transformation. Political and policy responses can either pave the way for peace and development—or build up tensions and, eventually, trigger conflict. Sustainable Development Goal 16 (the ‘peace goal’) is a key policy opportunity to safeguard development gains in the Pacific. 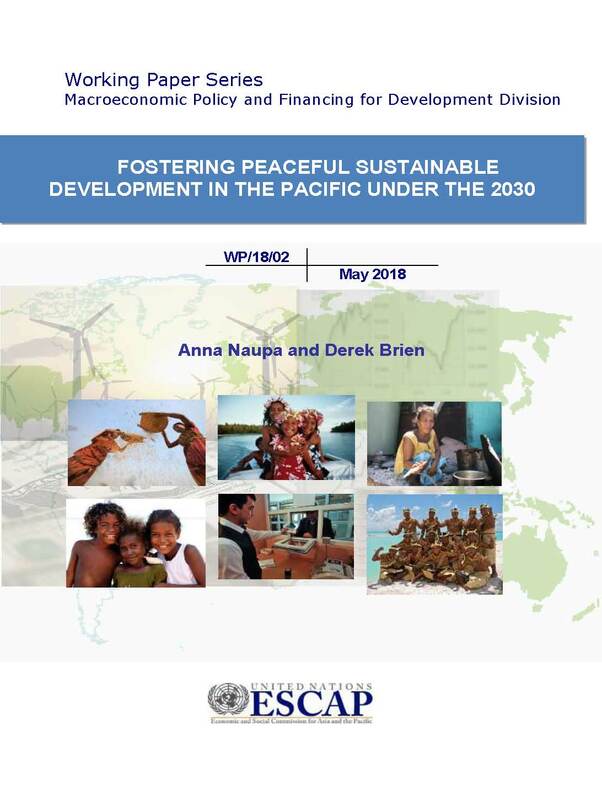 Fostering peaceful sustainable development in the Pacific will require a re-thinking of the development approaches taken, particularly where pervasive exclusion and inequality are linked to potential drivers of conflict. This paper highlights four areas for attention: resource scarcity, migration and displacement, urbanization, and exclusion and inequality. As a threat multiplier, climate change exacerbates all of these development challenges, and the policy urgency is immediate. Future conflict can, however, be avoided. The paper offers that for Pacific island countries, policy emphasis on strengthening institutions – both formal and informal – combined with conflict-sensitive programming will go a long way to mitigating drivers of conflict and realizing the intent of SDG 16 as ‘the peace goal’. Acknowledging limitations in the reach of and access to Pacific island state institutions, many such solutions will necessarily be through informal structures. At a regional level, a revisiting of the Pacific Human Security Framework 2012-2015 in the context of the 2030 Agenda and SDG 16 may also offer new ways to guide and monitor peaceful development.